Over the past few weeks I’ve won on the Lottery and Premium Bonds. A grand total of £37.10. Not being financially savvy, I was wondering if anyone could give me some sound advice on how to invest this huge sum? Perhaps the Government might need it or my local council could use it to help pay to repair all the potholes. I really didn’t want my winnings to go to my head, but, what a headache it’s turned out to be! MP Ward (YEP Letters August 27) gave seemingly good advice on food spending to people who depend on our local food banks, but it’s not that simple! Food poverty often exists alongside fuel poverty. Some people who rely on food banks do not have money for gas or electric. Some in privately rented accommodation do not have a functioning cooker. Some only have a microwave and kettle and have to become adept at assembling a meal from soup, tinned veg and meat heated in the microwave. 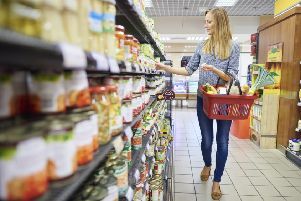 Most people know it’s more economical in the long run to buy in bulk, but when the budget is very tight everything has to be short term, with cleaning products, toiletries and clothes bought when/if possible. And there are other pressures on many food bank users the majority of whom have children and work. Just like all working parents, especially single parents, they are pushed for time. Shopping around for bargains is not easy and takes energy. It is hard to be on top of your game when your life is stressful and full of unrelenting problems. The food banks that I am aware of often put their users in touch with other support services such as CAP, CAB, other support groups and counselling services. There is a wide network of people, mostly volunteers, working avidly to alleviate the effects of poverty in many areas of the country; including locally, Leeds, Bradford, Keighley and the Wharfe valley. However, as I said, there are no quick or easy fixes and a lasting solution will not be found until the determination to decrease the widening gap between the rich and poor in our country is embraced by all our MPs and until we refuse to countenance any suggestion of fault, fecklessness or weakness on the part of those unfortunate enough to need to rely on food banks. on the accountability of rail chiefs, the problem is that you’re flogging a dead horse. Transport Secretary Chris Grayling and the rail bosses have got it all stitched up and there’s nothing that we, as Northerners, can do about it. And none of our elected representatives have the courage to take them to task. Not an inch of HS2 rail has yet been laid, but the big four consultancies have hoovered up tens of millions. Surprise surprise that PWC produced a favourable report for the Government recommending HS2. The whole of the Northern transport system (some would argue the UK transport system) is in disarray, but at least if you live in the South East or in London, taxpayers’ money is being thrown at the problem. We in the North are being marginalised and there’s nothing at all we can do about it. I HEARD with horror from someone who is looking after a property in Harehills, Leeds, of the total devastation there. It was described as being like a ‘third world’ country. Apparently council lorries go round with regular monotony picking up furniture, mattresses, fridges and God only knows what else which has been dumped in the streets. Is this how hard-working people’s taxes are being spent? I am sure that there are many more areas in the UK like Harehills where lives are being blighted. Of course there will be the same old rhetoric that we need more police but, even if we had a policeman standing on every corner in the country, our politically-correct system ties their hands so that the perpetrators win out over the victims. Dr David Hill, CEO, World Innovation Foundation, Huddersfield. IN the future, and from now on when I hear the name of Philip Hammond, I will just think in amazement of how he is a seer of the future and doomsayer all rolled into one. How such an intelligent being can predict that a no-deal Brexit will increase borrowing by £80bn a year by 2033 is just beyond my comprehension when he did not even see the global meltdown coming in 2007? Indeed, if the Chancellor of the Exchequer had such miraculous predictive powers, then he could have warned us all some 15 years before the crash happened (as he is now predicting about Brexit) and saved us all a whole load of grief. Or could it possibly be that our Government hierarchy is just basically losing it completely and Brexit is affecting its collective minds? I HAVE recently been a victim of an ailment – Trumpitis. I refer to the blanket coverage, from morning to night, about Donald Trump. He is President of the USA, not the UK, and the issue of his presidency is for Americans to resolve. They will decide whether to give him a second term, not the media here. This simple fact seems to be overlooked by many. FREE marketeer Toby Young sold the Government a pup with his free school programme. The NUT estimated that the Government had wasted over £100m on the 62 free schools, university technical colleges and studio schools that effectively failed to get of the ground. His own West London free school has gone through three heads and he himself had to resign from various posts; yet here he is promoting more pie-in-the-sky ideas to resolve England’s shortage of skilled individuals. I have long since lost count of the number of different types of state school that we have in this country. Every Education Minister seems to add his own pet scheme to mix without making any significant difference to the overall results. My friends abroad are bewildered by the complexity of our system. In France, Spain and Italy, theirs are based on a straightforward primary, middle and upper school system with specialisation only in the final two years, but all subjects are studied up to the end. In France, even Philosophy is taken by everyone. Finland, consistently one of the best performers, has an even simpler seven to 16 years comprehensive arrangement. They believe that the comprehensive nature of their schools is the key to their high achievement across the board. The town was sad to hear of the death of the vice chairman of the Morley branch of the Royal British Legion ,Mike Brown. Mike was a perfect gentleman, kind and supportive. He was sincere and hard working in his efforts to support the British Legion and he will be sadly missed by all those knew him. The world was a better place to have known him. I AM doing historical research on Corporal Parker, George Austin 320035 of the 9th Queen’s Royal Lancers, Royal Armoured Corps who died age 20 on 5 June 1940, killed in Oust-Marais, near Bresle River, in France. He was a son of Harold, and Jane Parker, of Bramley, Leeds. My project to regain their descendants whenever possible to create a link in order not to forget the sacrifice of these young soldiers for our freedom. It was inevitable with the hot weather this summer the man-made global warming brigade would be shouting: ‘Told you so!’ At the end of the last ice age, there were no power stations, jumbo jets or Range Rovers. So what caused the thaw? Could it have been, er, global warming? The YEP wants you to share your views with other readers.